It's hard not to be disappointed with this figure. Not because Apeface himself is a bad toy -- he's far from it. But because Apeface is exactly the kind of figure that the Titans Return line was perfect for, and instead of getting a lovely triple-changing Voyager-class figure he's stuck as a pocket-money toy while Hasbro shits out garbage like Alpha Trion and yet another bad Voyager Optimus. And while that has nothing to do with the merits of this particular toy, it's hard to be completely objective. 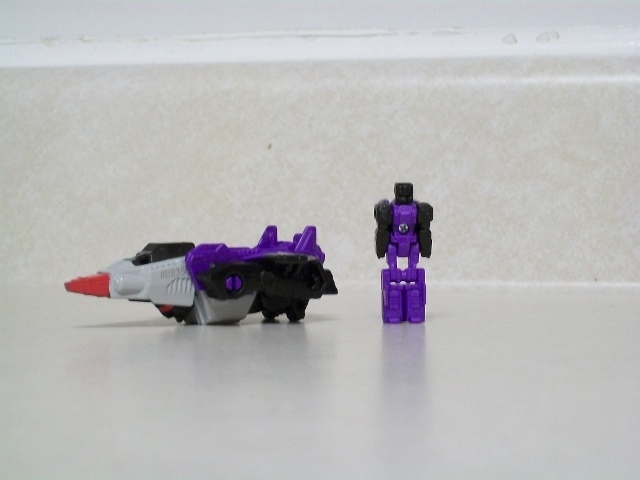 Titan Master: The mini-figure in the set actually turns into Apeface's head, so I guess technically this little guy is Spasma -- which only makes sense considering the mini-vehicle is a dead ringer for two of G1 Apeface's three modes. He's mostly purple, with black arms and a black head and (like most of the later TMs) absolutely zero robot-mode paint apps. He looks fine, if a bit unspectacular. He's got the typical Titan Master articulation: ball jointed neck and shoulders, hinged hips and knees. Nothing fancy but fine for what he is. His head mode is, as I said before, Apeface's head. 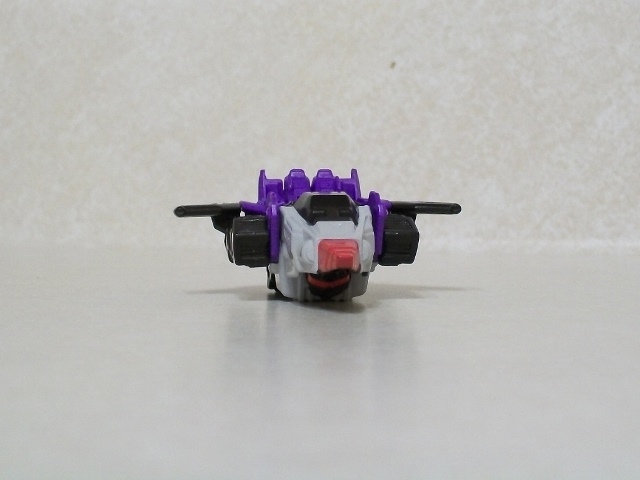 His robot head, that is -- in G1 Spasma served as his head in both robot and beast modes. It's a very striking head design with a very nice-looking faceplate, but two things are keeping it from being my favourite head. First is that the eyes are too dark, almost black, when they really needed a bright Decepticon red to pop. The second is that his purple just doesn't go well with any of the figures I own. 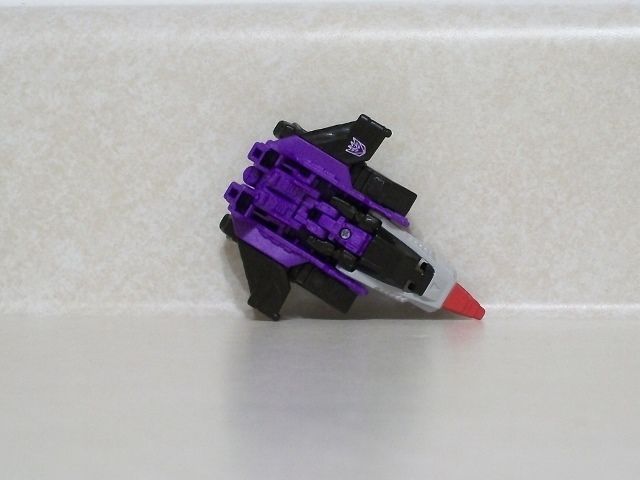 You'd think that Mindwipe or Astrotrain would be good fits but their own purples are different enough shades that he clashes pretty severely. 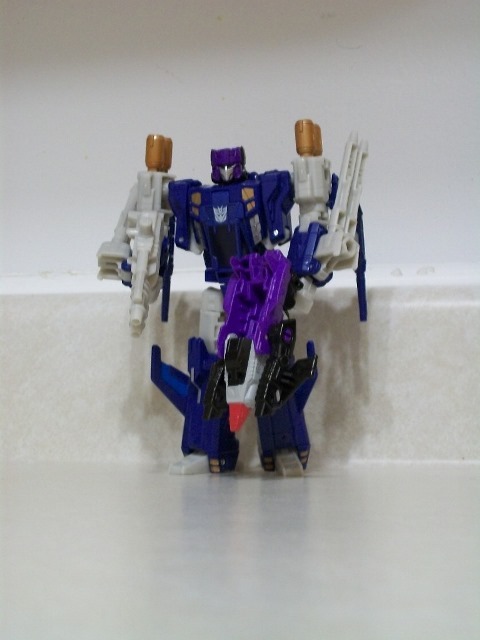 About the closest he comes to looking good is being mounted on Triggerhappy, but everyone looks good on Triggerhappy. Beast Mode: The Apeface mini-vehicle is a spot-on representation of the original's beast mode, albeit owing more to the box art and character model than the actual toy itself. It looks quite good, but unfortunately doesn't do much more than that. 'Spasma' can stand on the ape mode's back and ride it around, though it's not necessary. The ape mode actually has less articulation than the tiny Titan Master, with nothing but shoulder swivels to speak of. And to make matters worse, if you actually pose him in anything but the default knuckle-dragging pose Apeface will fall flat on his, uh, ape face. Considering the mini-vehicle is the size of a Minicon, this just isn't good enough. I could understand not giving him poseable legs considering his design and small size, but ball-jointed shoulders, elbow hinges, a head swivel and the ability to actually stand on his own two feet would seem like a prerequisite for me to call this mode "good", or even "adequate". He can't even pop his own arm off and smack Rampage with it! 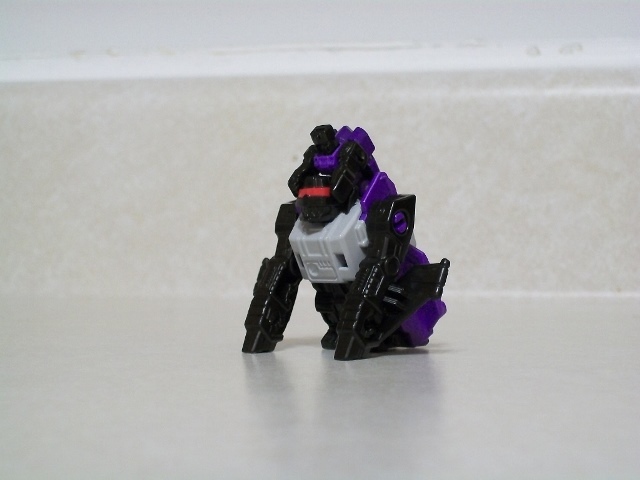 Jet Mode: Apeface's jet mode is, like the beast, a callback to the original figure. In this mode, the Titan Master's participation is almost mandatory, since if you don't plug him in the entire fuselage of the jet is missing. It's a fairly solid jet once he's installed, but it lacks any real weaponry so there's not much to do with it other than swoosh it around. Gun Mode: Do you consider "jet with monkey arms grabbing forwards" a valid weapon design? If so, I've got good news for you! For the rest of us, we're probably going to ignore it.